From an early age, art has been a part of my life. As a child and throughout my school years, I would spend hours drawing everything I saw around me. 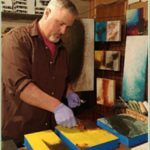 As I became an adult, life left little time for the exploration of my creative side. In 2009, my wife and I welcomed our first child, Owen, into the world. That moment changed my life in so many ways. We decided that I would put my career on hold and stay home with our new blessing. It has been almost nine years with Owen and our amazing younger child, Drew. Having two little boys has opened my eyes to the world around me in unexpected ways. Watching them discover the colors and wonders in this world encouraged me to pick up the paint brush again. Summit Art Studio was inspired by our family travels to one of the most beautiful places in the United States, Summit County, Colorado. Many scenes from our mountain travels along with the other places we have visited, have become my subject matter. Along with landscapes and the occasional still life, I have started exploring abstraction. My abstract work speaks to history, age, and patina. I love to see the layers of life in objects. Revealing the history or the journey of something I have found has become my passion. The school day is now my painting time. In the past year, I have had my work in art fairs, markets, and taken part in the MHAAA Spring Art Tour. The biggest honor was being asked to donate pieces toward fundraising efforts. Helping others has always been important to our family and I feel so fortunate that my artwork can be used in this way. I am a member of the Mount Horeb Area Arts Association, Wisconsin Visual Artist, and Wisconsin Alliance of Artist and Craftspeople.